Welcome to the Sliders Online Auction, part of the first(hopefully annual)Sliders Online Convention. Please take a moment to read the following questions and answers section before browsing the items and placing your bids. The prices next to each item are the final selling price as of 10 AM 2/2/98 and may show changes in price from the midnight close of the auction. Your sale is not confirmed until you recieve an email from the auction informing you that you are the winner. Please select one of the item you wish to bid on. If you wish to bid on more than one item, you will need to bid on each item separately. Any bids recieved prior to 6PM Eastern Time on Friday, January 30th will not be accepted. Items listed twice indicate multiple items up for bid. Note:The comics listed are in good condition..not mint, but good none the less. 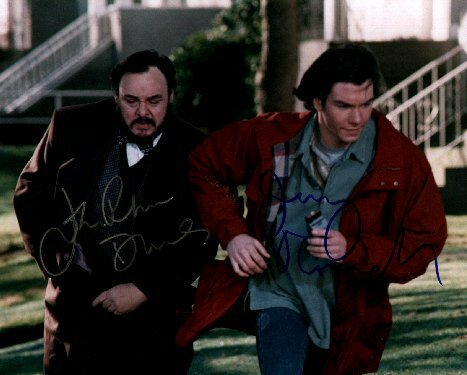 Below are listings for EBay auctions currently involving Sliders merchandise(or merchandise featuring the stars of the show)will also be listed--you will need to follow the instruction posted on each site to place your bids for these. Once again, we have no connection with EBAY, and assume no responsiblity for the items listed at the EBay site. If you have questions, please refer to the EBAY website.